The Capresso 485.05 MT600 Plus coffee maker is a well-built and powerful model and I have been using it for almost a year with absolutely no problems to report. Initially, I was looking for an expensive unit but decided to try this model instead because of the discount price I found online. I expected there may be some flaws to deal with but this machine works much better than any I have ever used. The features available on the Capresso 485.05 make it easy to brew because it does not require much time like other coffee makers. Also, the taste is always high quality and exceeds the flavors of cafe-bought coffee. 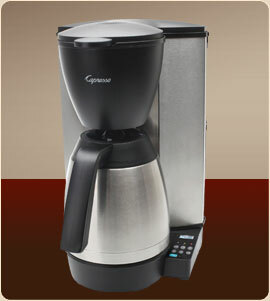 When brewing with this coffee maker, I can save time and money by taking advantage of some basic and unique features. The Capresso 485.05 offers many features as well as a capacity of 10 cups which is fairly standard on most coffee makers these days. But the performance is much better because this unit works fast to finish an entire brew in just under 8 minutes which is less than a minute per cup. Even expensive machines I have had in the past cannot offer great flavors in such a short time. There are also fully programmable features on the Capresso 485.05 coffee maker which can be a great way to save time if you are looking to preset the brew to start later. I take advantage of this feature every day by setting the options the night before so I can wake up to amazing aromas in my home. There is also a unique aroma function which allows you to brew smaller pots that include bold flavors. The Capresso 485.05 comes with a charcoal water filter which ensures that only flavorful coffee will be in the brew. Most machines may come with a filter but you can never be sure when it needs to be replaced. This unique model comes with an indicator alarm which will let you know exactly when a filter change is needed. Certainly, the Capresso 485.05 coffee maker is not my favorite machine to date only because of regular features. There is much more to enjoy on this machine like a stainless steel body that is fingerprint-proof and will look like new even after months of constant use. The carafe is also equipped with double-layered vacuum technology which will lock in the heat and freshness for up to 4 hours. In addition to a thermal carafe, there is also a unique lid that will ensure secure closure and also keeps the heat inside for longer than other models. The pouring spout is also drip-free to minimize spills and therefore reduce the need for cleaning. The Capresso 485.05 coffee maker also comes with a gold-tone filter inside. This high quality filter will remove all impurities that are usually found in tap water.